Thanks to the relationships fostered by Dr. Kevin Robertson who heads up the College’s Sustainable Use and Field Guiding Unit, Pack Leader Pet Products (Pty) Ltd, a leading provider of nutritionally appropriate pet food, have taken a decision to support the SAWC’s K9 program with food at no charge, effective immediately. This exciting news comes on the back of a visit to the College facilitated through Veterinarian and General Manager of Pack Leader Pet Products (Pty) Ltd Matthew Robertson. The company is the South African distributor for Champion Petfoods a brand that markets its products as biologically appropriate dog and cat foods. 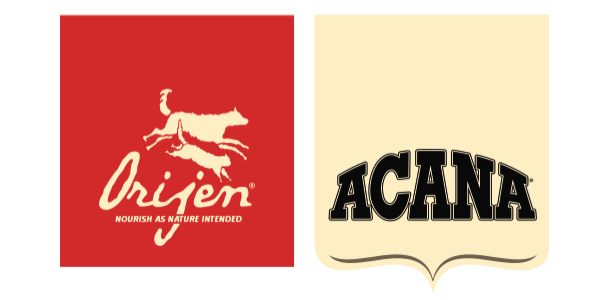 Their ORIJEN and ACANA products mirror the quantity, freshness, and variety of meats that dogs and cats are evolved to eat and that nourish them completely. Despite their long and close association with humans, the dog remains closest genetically to the grey wolf, with whom dogs share over 99% of their mitochondrial DNA. Just like wolves, all dogs evolved as carnivores, with anatomical features that clearly adapt them for meat-based diets. Wolves evolved and thrived on a diet of meat (elk, bison, deer, etc. ), fish (salmon, trout, grayling, etc. ), game birds, (sage hens, grouse, quail, ducks, geese and the like) and a wide variety of naturally occurring berries and fruits – nothing else! “No wolf ever derived its significant daily protein requirements from plant based proteins like maize and soya beans, and yet in this modern day world these are the primary components of what most dogs are fed. 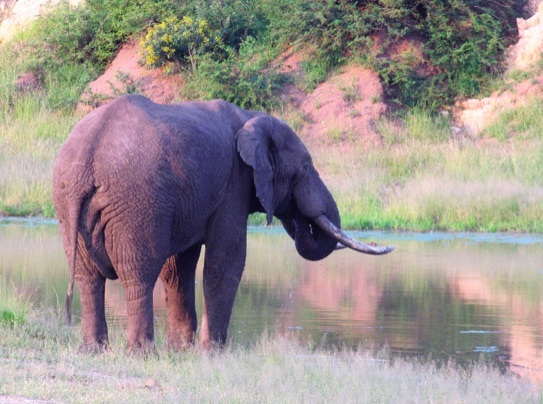 The results of these incorrect and ill-suited diets can result in skin and allergy problems, obesity, and medical conditions too numerous to mention,” says the SAWC’s Dr. Kevin Robertson, who is also a qualified veterinarian. There can be no denying the fact that such high quality dog food was, for the K9 Unit’s restricted budget, expensive – despite the fact that Pack Leader were selling the College the food at a hugely discounted rate. “We were often overjoyed to find our regular order ‘supplemented’ with donations. This generosity really boosted the moral of the K9 Unit, especially when the packs started to gain some impressive successes,” said Kevin. Matthew however wanted to do more, and helped convene an information and workshop weekend to showcase the K9 Unit in April. Guests included Champion Petfoods Canadian Sales Manager, Joseph Obrovac and his wife Kristina; the CEO and COO of Pack Leader, Grant Walliser and Sonja Maricevic; Pack Leader’s veterinary staff, Dr. Natanya Smit, Dr Shayna Basson, and their dynamic marketing duo, Cherene Denoon-Stevens and Charese D’Alessandro, together with 13 of the country’s leading small animal veterinarians. While the K9 Unit’s hound master, Johan van Straaten could not be there for the occasion, Tina de Flamingh, and her two assistants, rose to the challenge. “As always, the K9 Unit’s kennels complex was spotlessly clean when the group of 22 visited it on the afternoon of Friday 13 April. Richard Sowry filled us in on how the K9 Unit got started and then it was time to inspect the dogs. They looked great – healthy, trim, and athletic,” said Kevin. 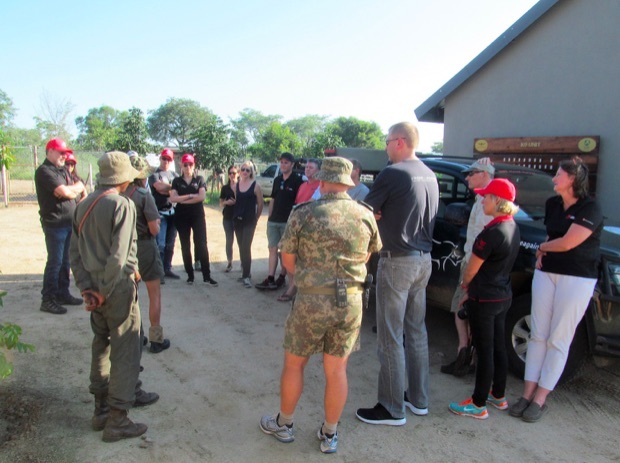 During their visit, the guests were given the opportunity to see the K9 Unit dogs train on a trail. 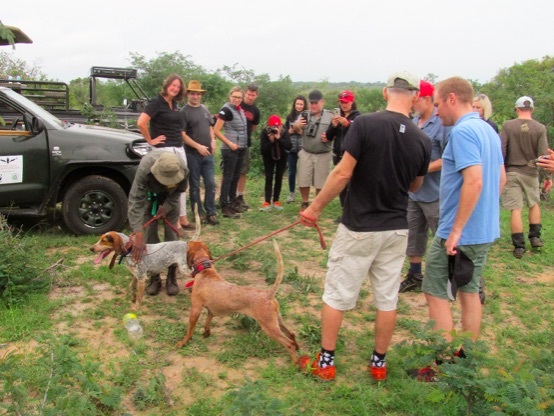 Most of the veterinarians volunteered to act as ‘poachers’ and we ‘laid a trail’ of about 20 minutes for the dogs to follow. As soon as the ‘poachers’ arrived at the hidden game viewers, the hounds were released and it was not long before they were spotted heading straight towards the hiding course participants with their noses glued to the ground while following the scent. 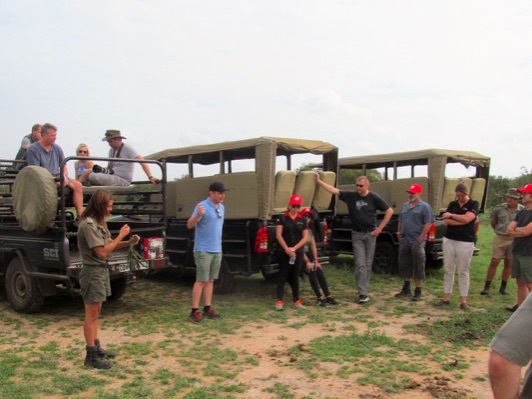 The visitors were also able to attend a rhino capture exercise. 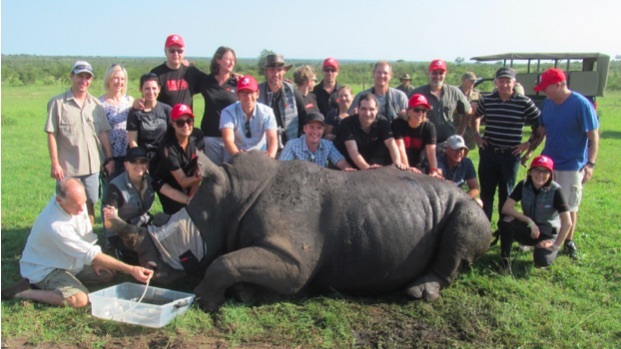 Dr. Peter Rogers and the SAWC’s capture team slickly darted a six-year old bull that was ear notched, micro chipped, and DNA sampled before being quickly reversed. With Pack Leader’s support, the K9 Unit can only go from strength to strength – and for this, all of us at the SAWC are extremely grateful.